Editor’s Note: This article is not about stocks, but teaches an important lesson about investing. After several hard weeks of stock research, I decided to get out of town to attend the WBC Heavyweight Championship fight between reigning champion Deontay Wilder (now 38-0, 37 KOs) and Gerald Washington (18-1-1, 12 KOs). 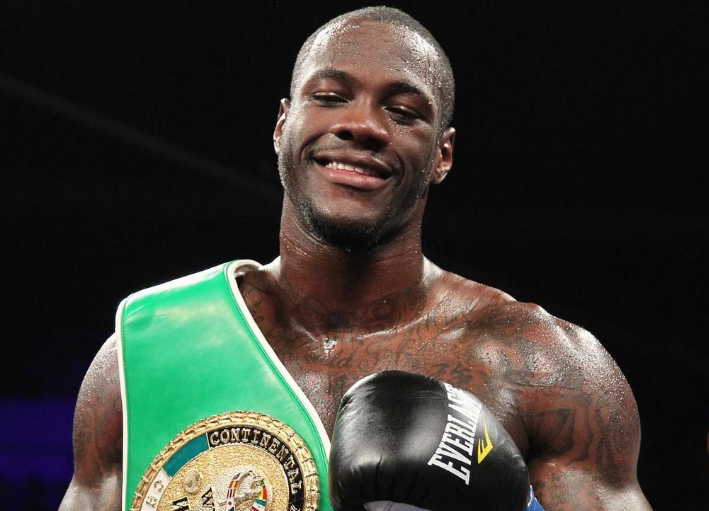 Wilder prevailed by TKO in five. After feeling (and wearing) his opponent out for four rounds, Wilder unleashed a fifth-round storm that culminated in a referee stoppage. Unfortunately, the win was marred by an incident involving Dominique Breazeale, the WBC’s #11 ranked heavyweight who won an undercard matchup. For background and the media’s take on the incident, you can Google Wilder Breazeale brawl. In short, Breazeale got into a confrontation with Wilder’s younger brother (Marsellos) at the arena, right after Wilder’s fight was stopped. Later, Breazeale was waiting for Wilder at the hotel when he arrived. The two were jawing at each other when two guys grabbed Wilder, causing a mob scene to unfold. A couple of hours later Breazeale would claim that he and his family was attacked by Wilder and 20 thugs. Well, I was there (before it happened until after it was over) and near Breazeale for most of the incident… and what I saw couldn’t have been further from what Breazeale described. For starters, even before Wilder got back to the hotel, Breazeale was hanging out there (near the elevators). I’m not one to make assumptions, but I couldn’t help wondering why Breazeale was mingling on the path to Wilders room. When Wilder’s bus arrived at the Westin (around 11:30), Breazeale and some of his people made their way to the middle of the lobby. 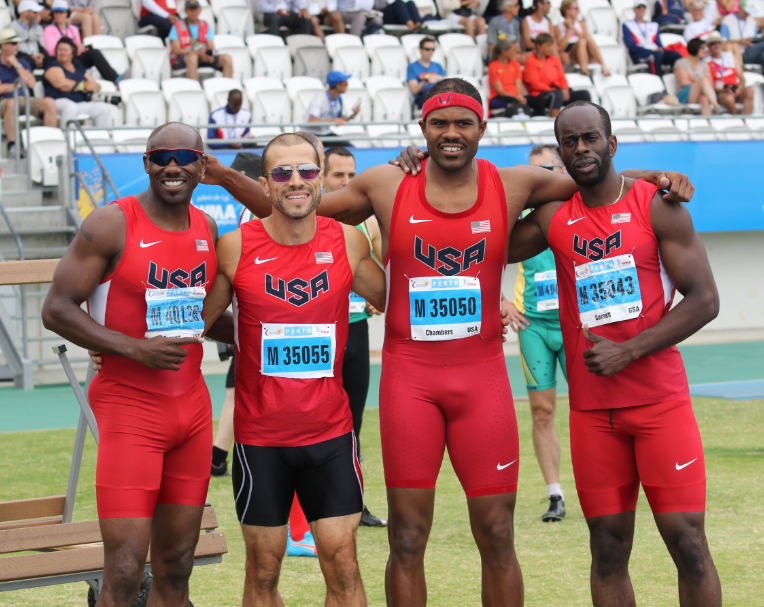 At this point, I think it was safe to assume what Breazeale had in mind. I just wonder why he had his wife and two young sons there, as he claimed. Wilder entered the hotel and Breazeale faced him. Wilder confronted. I couldn’t hear what was being said, but Wilder definitely seemed upset. The conversation was nose-to-nose and heated but did not get physical until a big guy and Breazeale’s trainer grabbed ahold of Wilder. This is when things started to escalate. It’s hard to say how many of Breazeale’s people were in the lobby, but only a few of Wilder’s people were there at this point. Most of them were still filing into the hotel from the bus. 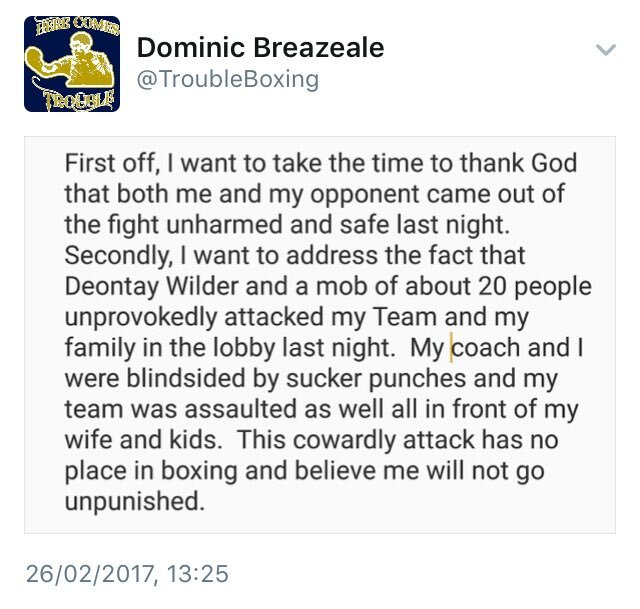 Again, a far cry from Breazeale’s claim that 20 men attacked him and his wife/kids. Eventually, Wilder’s younger brother, Marsellos, entered the hotel. He made his way through the crowd and started having words with Breazeale. All around the lobby, there was a lot of pushing and restraining, but no punches were being thrown… until Breazeale hit Marsellos in the face. Marsellos came back at Breazeale and landed a blow to the jaw, dropping Breazeale to the floor. The mob flowed toward the elevators. Wilder, who had gotten free, had a brief shouting match with someone before heading toward the elevators. When I made my way over there, his people were getting into the first elevator. Wilder then ushered his brother into the elevator, writing an end to the situation. That’s a lot different than what Breazeale posted to his Instagram and Twitter accounts. For the record, I saw Breazeale’s wife there, but not the kids. She was not being attacked, which you can see at 9-second mark of the TMZ video (she’s in the crowd yelling, but not being accosted or yelled at by anyone). I’ll leave the final judgment to the public, but Breazeale’s statement runs 100% counter to what I saw, along with statements attributed to the Birmingham Police, and numerous other eyewitness accounts that paint the picture of a shoving match, not an “unprovoked attack” perpetrated by 20 assailants. If you ask me, it appeared as if Breazeale was fishing for some free PR and a title shot. If that’s true, I can’t knock the man for trying to make a bigger name for himself. But involving (and especially striking) another man’s family has no place in any business, including professional boxing. That’s not how to ask for a bout — it’s how you ask for a war. Either way, this was eye-opening view into the world of professional boxing and the incredible difference between what you read in the media versus the actual truth. I think the answer is an unequivocal “no”. First of all, Wilder was dismissive of Breazeale in his post-fight press conference. Rather than address Breazeale, Wilder deftly pointed out that Izu Ugonoh led most of the early-evening bout. He then implied that Ugonoh would have won if he had simply paced himself better. FYI, USA Today Sports agreed, describing the fight as a lopsided affair that came down to two haymakers from Breazeale (and Ugonoh’s well-known trouble with handling big shots). 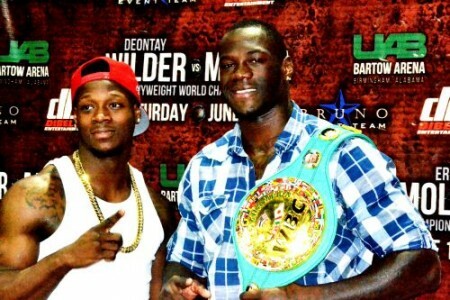 Secondly, Wilder has been very vocal about unifying the heavyweight division. WBO champ Joseph Parker was in attendance in Birmingham this weekend, reportedly to scout and meet with Wilder about unifying their belts. All of this leaves Breazeale out in the cold. But this should come as no surprise. He’s not ranked among the top 10 fighters in the world and did little to help his cause in this weekend’s narrow escape against Izu Ugonoh. All in a day’s work in the world of professional boxing. For all you investors, the lesson is clear. Be careful of where you place your trust. Stories can get distorted beyond original comprehension leading to equally distorted conclusions. Pump-n-dumps and bashers abound. This is yet another reason to investigate the facts until you can be sure of the true picture.